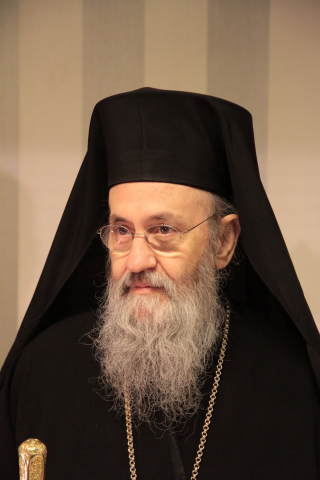 The Theological Problem With the Phrase "Value of the Human Person"
On March 5, 2016 Metropolitan Hierotheos of Nafpaktos issued a letter to the Holy Synod of the Church of Greece, requesting that certain phrases and terms be changed or deleted from two issued texts to be discussed at the Holy and Great Synod in June 2016. The text titled "The Mission of the Orthodox Church in the Modern World" contains some problematic phrases related to divine and human personhood, which contradict the patristic understanding of the term "person". After stating the changes that should be made, he concludes by issuing a summary of the theological justification for this change, which has been translated below. 1. The Fathers of the fourth century determined that the Triune God is Three Persons, having the same essence-nature-energy and particular hypostatic properties (unbegotten, begotten, proceeding). Person is defined as essence with hypostatic properties. 2. In the Triune God there is a distinction of Divine Persons, not a communion of persons. In other words, the Father communicates His essence to the Son through begetting, and to the Holy Spirit through procession. The Father thus communicates His essence to the other Persons, but not His Person or His hypostatic property. There is thus a communion of nature-essence, an indwelling and interpenetration of Persons, and not a communion of persons. 3. “The holy Fathers used hypostasis, person and individual to refer to the same thing” (St. John of Damascus). Christ is one Person Who has two natures which were united in His Person without confusion, without alteration, without division, without separation. Thus, the person is one and the individual is one. The word individual (atomo) consists of the negative a, the word tome, and means “not intersecting nor shared” (St. John of Damascus). This means that although Christ has two natures, they do not intersect in the one Person of Christ the Word. The distinction between person and individual comes from Western philosophy. 4. For man, the Fathers primarily used the term “man.” And there is a chasmic difference between created and Uncreated. Whatever happens with the Triune God does not happen with man. The theological concept of man is expressed by the term “in the image” and “according to the likeness,” which mean that he is lead towards deification. In certain patristic texts man is spoken of as hypostasis, but always with the theological meaning of in the image and according to the likeness of God, with the principle of hypostasis (Heb. 3:14). And it is from this understanding that Elder Sophrony also writes, not from the perspective of modern philosophy. 6. The problem, however, is not just the term “person” used in relation to man, but that the modern theories regarding the “human person” and even the “sanctity” and “dignity of the human person” associate nature with necessity and sin, and person with freedom, desire-will and love. Such ideas are reminiscent of Arianism and Monothelitism, which have been condemned by Ecumenical Councils. 7. Will and self-rule do not belong to the person, but to nature. The person is the one who desires, while desire is an appetite of nature and will is a result of the desire of the one who desires. When will-desire are seen as hypostatic, that is to say, belonging to the person, then each divine Person has Its own desire, will, freedom, something which results in tri-theism. The 6th Ecumenical Council orders the deposition of bishops and clergy, and the excommunication of monks and lay people, who accept the notion of hypostatic will. 8. Thus, while scholastic theology identifies energy with essence, modern personalist theories associate the energy-will with the person and introduce a voluntarist personalism. Since there are all these problems in the text, the phrase “value of the human person” must be replaced by the phrase “value of the human being” and all the related expressions need to be corrected. If this does not happen, the entire text will be affected and, more importantly, the probable decision of the Holy and Great Council will be divergent and opposed to those of the Ecumenical Synods from the Fourth onwards.